If your results are better than you expected, you may be in a position to consider studying at City by applying through Adjustment. The Adjustment process starts on A-level results day and runs until late August. If your results are better than expected, you can call our hotline number once the Clearing process opens to apply for a course. We will consider students interested in Adjustment across City, should you meet the advertised entry requirements. If you choose to register for Adjustment, your Adjustment period starts whenever your conditional firm (CF) choice changes to unconditional firm (UF) and lasts for five consecutive days. As you have a limited time to change your university choice through Adjustment, it's important to ensure you're prepared and have read the information on our website. Register in your UCAS Track account by clicking on 'Register for Adjustment' on your 'choices' screen. Contact us on our hotline number once Clearing opens or email us to ask if we have a place on the course that you would like to apply to. We will check that you exceed the conditions of your unconditional firm choice. We will tell you if we can offer you a place and you can then tell us if you want to accept it. If you are accepted through Adjustment, your track screen will be updated with the new choice and we will send you a confirmation letter. If you want to know more about what the process is like, you can read about Shivani's experience of coming to City through Adjustment from The City Scoop on Medium. Am I eligible for Adjustment? Your results have exceeded the conditions of your conditional firm (CF) choice. Your original offer was unconditional. It is important that you check that you are eligible for Adjustment as this is what gives you the saftey net of keeping your original UF. If you submit yourself on UCAS Track and you are not eligible, you would then need to use the Release into Clearing process and would not be able to keep your previous UF. 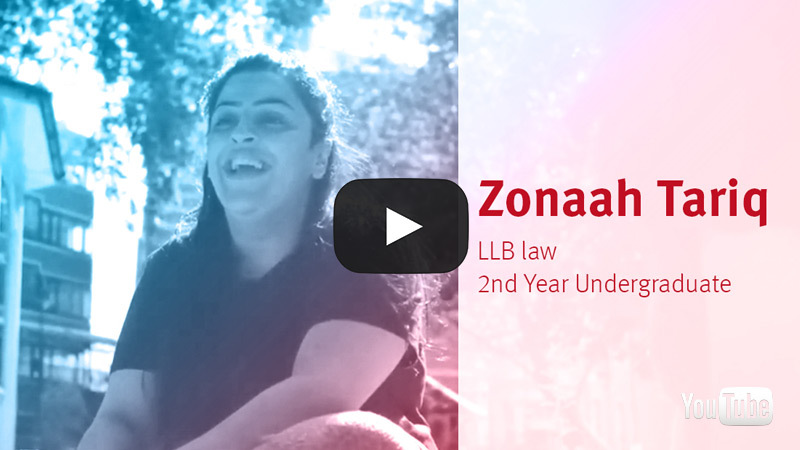 Meet Zonaah who joined City through UCAS Adjustment and is now studying on the LLB Law degree.